What Sort Of Safety Tests Do Car Companies Apply? Believe it or not, these days, it is safety that sells cars. For this reason, car makers put the cars that they produce through rigorous tests in all sorts of environments, just so they can one-up competitors and meet the standards sought by consumers. Although a majority of tests are performed on closed tracks, it is necessary for some real-world car tests to be performed in real-world conditions. This procedure covers various aspects such as comfort, performance, safety and reliability. The basic idea behind the execution of safety tests is that it makes it possible for manufacturers to determine any potential problems that might come up in a particular situation before it is moved into full production. So, what sort of safety tests do car companies conduct? Below, we’ll take a look at a few of them. This is a fairly important assessment that tests car crash configuration. In this test, a crash is simulated by having the driver’s door impacted by a mobile deformable barrier (or MDB) at 50 mph. 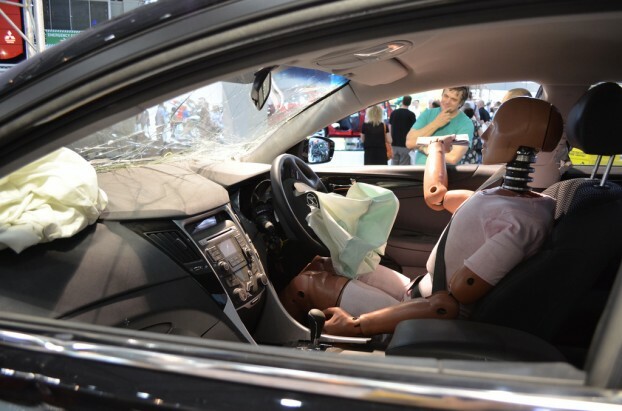 The test assesses injury protection with the help of a side-impact test dummy placed in the driver’s seat. In the frontal impact test, car makers check the ability of the car to survive impacts that don’t cause damage to the passenger compartment. To induce a frontal impact, the test car strikes an offset deformable barrier at 40 mph. Considering that a majority of crashes that take place in real life involve only a part of the car’s front side, this particular test is offset to replicate a half-width impact that can take place between two separate cars. For this test, 40 percent of the car is allowed to impact a deformable barrier. These are front and side impact crash tests in which dummies represent children between 1 ½ and 3 years of age. They are placed in the rear seat of the car with restraints. In the test, aspects such as chest acceleration, head movements and neck loads are assessed. The term whiplash is used to refer to a distortion that often occurs within the spine during side and frontal impact accidents, along with rear-end, low-speed collisions. It has the potential to lead to extremely painful symptoms over time. A rear-impact test is used to assess the whiplash effect. One setback to this test is that the exact mechanism that causes the injury is not known as of yet. However, it has been deduced that the overall risk of injury tends to be influenced by the head restraint design. For this reason, the test is used to promote best practices in seat design, particularly in terms of head restraint geometry. For this particular test, a car is propelled at a speed of 18 mph sideways straight into a rigid pole. For substantial penetration to take place, the pole used is quite narrow. This helps car makers assess safety in terms of side impact collisions. With so many tests completed on every make and model available, don’t forget to check the crash test ratings of each option in your next vehicle purchase. It is important to put safety first when you buy, and these ratings make it easy to understand how different models stack up. Markus Bellamy is a freelance writer based in Little Rock, Arkansas. Markus specializes in Auto Accidents and Car Safety issues. Image credit goes to smjbk.